My first experience with VMware was at a customer that was running ESX 3.x which at the time was state of the art. I saw what possibilities virtualization could bring and from there I knew which way I had to steer my future career. The challenge! Definitely the challenge. But it was difficult to really get started, reading up on some information on the web made me doubt whether it was feasible to achieve. Then I turned to Niels Hagoort (VCDX #212) for advice and he gave me some excellent feedback which gave me that little boost to really get excited and fully commit to the VCDX journey. It actually started in May 2014 when I started at ITQ and sat the VCAP-DCA and VCAP-DCD within one month of each other (which I don’t recommend anyone on doing…). In 2015 I met Matthew Bunce at a joint project we did, which later that year in December we decided to use as the base of our joint VCDX-DCV submission. Stop whining and making excuses, just do it! If possible, work closely together with someone on a same type of design. There will be times you struggle to continue or just want to give up. Then a partner in crime will pull you through (thanks Matthew!). It sounds so cliché but it is the truth, it’s not about the certification it’s about the journey! I learned so much in such a small period because I got to speak to a lot of smart people for the mock defenses. It gave me a whole new view on creating designs and performing presentations. Don’t get caught up in all the information online, read it and use it as a guideline and build something that works for you! If I could go back the only thing I would do differently is to put more time between finishing the “final version” and the actual submission deadline. The reason for this is that we didn’t have enough time to put all the good feedback from the reviewers in the design in time. 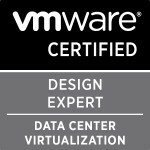 Pursuing VCDX has really changed my life so it was worth every minute of it. It has changed my perspective on a lot of things which I now can bring to practice during my day to day job. Don’t be mistaken, the journey takes lot of time and commitment and cannot be taken lightly. I had to miss out on some personal stuff which was sometimes quite hard. So I owe a big thanks to my wife and son, who were always incredibly supportive and never lost faith in me. Also a big thanks goes to my VCDX co-submitter Matthew Bunce! He had to put up with me during the last couple of months for late night design and mock sessions with all kinds of ups and downs. I’m quite lucky to work for a company that strives to “Playing champions league IT”. ITQ has the best bosses and colleagues I could wish for, they fully supported me throughout the whole process.